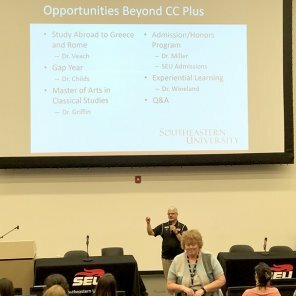 Lakeland, Florida— More than 150 Central Florida homeschoolers got a day-long taste of college life on Wednesday at Southeastern University (SEU). The students, who all participate in Classical Conversations homeschool communities, participated in college-prep workshops, tour campus, attend athletic events and even participated in an impromptu speech competition for a $500 scholarship. Several SEU professors and administrators who have children in Classical Conversations will be hosting the group. Scheduled sessions included: an overview of the CC Plus program and how it fits in with a CC education, thesis consultations with Dr. Grace Veach, School of Unrestricted Education, for CC Plus students enrolled in the English Composition II class in the spring, and a joint panel discussion with SEU staff and CC Directors about how to choose and apply for college. SEU offers eight online, dual-enrollment courses to CC students through CC Plus. April Jung, a homeschool mother of four from Homestead, Florida, brought three of her children to the event. Southeastern University is a Christian, liberal arts university in Lakeland, Florida. Established in 1935 as Southeastern Bible Institute, it became a liberal arts college in 1970. The university now has six colleges offering 55 bachelor’s degrees, 16 master’s degrees and two doctoral degrees. Southeastern has 7,000 students and is the largest Assemblies of God educational institution in the U.S. Classical Conversations® is a classical education resource used by homeschoolers in all 50 states and 22 foreign countries. CC now has almost 125,000 students enrolled in its tutoring programs, which are provided by more than 2,500 CC communities. CC provides resources, guidance and a community for a Christian home school curriculum using classical education in three developmental stages: grammar, dialectic and rhetoric.